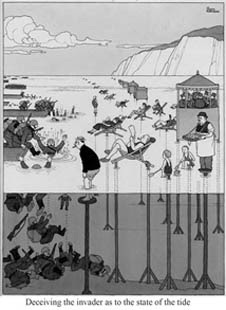 Please note: The exhibition – Heath Robinsonâ€™s Helpful Solutions – ends on October 7th and the museum is closed on Mondays. Simon Heneage, co-curator of the exhibition and author of the catalogue Heath Robinson’s Helpful Solutions, gives an illustrated talk on what makes William Heath Robinson one of the most English of all British cartoonists. Innovative space-making and architecture inspired by Heath Robinson’s Inventive World. CJ Lim, Professor of Architecture and Cultural Design at UCL’s Bartles School of Architecture, and Heath Robinson enthusiast, talks about his love of the artist’s work and how it inspires his own designs. This entry was posted in Clear Spot, Panel Borders on September 24, 2007 by alexfitch.